UBS Investment Builders offer investors a convenient way to borrow money to build a portfolio of listed securities such as shares and exchange traded funds. You can purchase UBS Investment Builders directly via a broker the same way you buy shares listed on the ASX. When you buy a UBS Investment Builder, you will receive exposure to price performance, dividends and potential franking credits from the underlying share. To exit your investment you can simply sell the UBS Investment Builder on the ASX through your broker. You can borrow without credit checks and all or part of the interest paid on the Loan should be tax deductible, making this a tax effective investment1. The sum of your Purchase Price and the Loan Amount is used to pay for the underlying share and Interest for the current Interest Period. 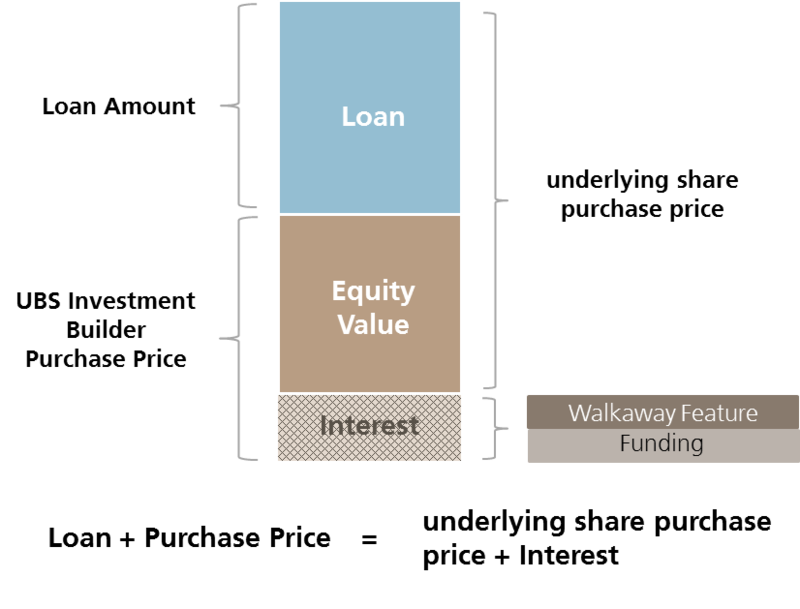 However, you should note that if the underlying share price is less than the Loan Amount, then your Equity Value will be zero and your interest cost for the current Interest Period will be equal to the sum of your Purchase Price and the excess of the Loan Amount over the underlying share price. Are UBS Investment Builders Right for you? How to identify UBS Investment Builders? Speak to your financial adviser or stock broker or contact UBS to get a copy of the Master Product Disclosure Statement and Term Sheet. 1See "Taxation Summary" in Part 8 of the Master PDS for more information. This information is communicated by UBS AG Australia Branch (ABN: 47 088 129 613, AFSL: 231087) and/or its affiliates ("UBS"). 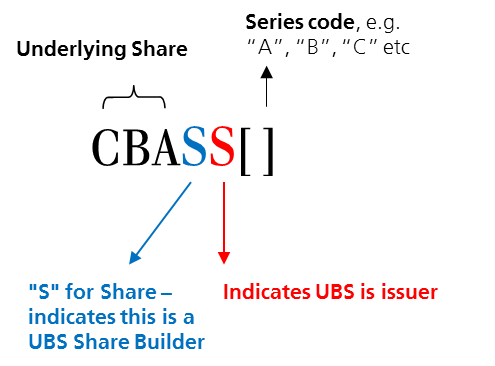 Before making an investment decision, clients should read the relevant UBS Dividend Builder Master Product Disclosure Statement (PDS) dated 17 October 2014 or the relevant UBS Share Builder Master PDS dated 25 September 2014 or 16 October 2015 as applicable, the relevant Term Sheet applicable to the Series they wish to invest in (together the "PDS") and any applicable Supplementary Product Disclosure Statement(s) ("SPDS"), including sections relating to Key Risks. These documents are available by calling UBS on 1800 633 100 or on the website www.ubs.com/investmentbuilders. This web page does not take into account your investment objectives, financial situation or particular needs. Accordingly, nothing on this web page, the PDS or any SPDS is a recommendation by UBS or its related entities or by any other person concerning investment in any financial product and before acting on this information, you should consider its appropriateness having regard to your situation. We recommend that you not only consider the information in the PDS and SPDS but also obtain independent financial, legal and taxation advice as to the suitability of an investment in a financial product (bearing in mind your investment objectives, financial situation and particular needs). Structured products and UBS Investment Builders are complex and may involve a high risk of loss. An investment in UBS Investment Builders is only available to persons receiving the PDS and SPDS in Australia. The PDS and SPDS do not constitute an offer of any financial product in any place in which, or to any person to whom, it would not be lawful to make such an offer. The distribution of the PDS and SPDS in jurisdictions outside Australia may be restricted by law and any person who resides outside Australia into whose possession this information comes (including nominees, trustees or custodians) should seek advice on and observe those restrictions. The financial products discussed on this web page, the PDS and SPDS may not be offered or sold in the United States of America (US) or to, or for the account of or benefit of, US persons. Accordingly none of the PDS, SPDS or the Application Form may be sent to persons in the US or otherwise distributed in the US. UBS may from time to time, as principal or agent, have positions in, or may buy or sell, or make a market in any securities, currencies, financial instruments or other assets underlying the product or transaction to which this web page relates. UBS may provide investment banking and other services to and/or have officers who serve as directors of the companies referred to in this web page. UBS may pay or receive brokerage or retrocession fees in connection with this product or transaction. 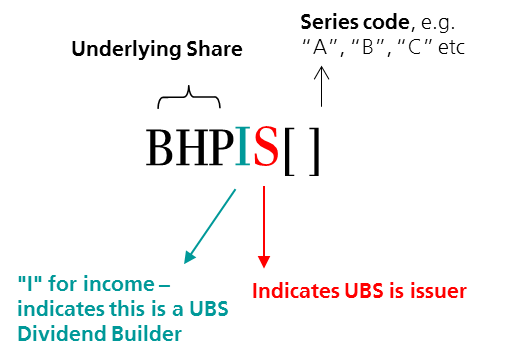 UBS' trading and/or hedging activities related to this product or transaction may have an impact on the price of the underlying asset and may affect the likelihood that any relevant barrier is crossed UBS has policies and procedures designed to minimise the risk that officers and employees are influenced by any conflicting interest or duty and that confidential information is improperly disclosed or made available. UBS AG, Australia Branch is a foreign Authorised Deposit-Taking Institution (foreign ADI) under the Banking Act 1959 (Cth), and is supervised by the Australian Prudential Regulation Authority. It is important for you to note that your investment is not a deposit product or other deposit liability and is not covered by the depositor protection provisions in the Banking Act 1959 (Cth). - Deposits are not covered by the financial claims scheme and are not guaranteed by the Australian Government. - Deposits do not receive priority ahead of amounts owed to other creditors. This means that if a foreign ADI was unable to meet its obligations or suspends payment, its depositors in Australia would not receive priority for repayment of their deposits from the foreign ADI's assets in Australia. - A foreign ADI is not required to hold assets in Australia to cover its deposit liabilities in Australia. This means that if the foreign ADI was unable to meet its obligations or suspends payment it is uncertain whether depositors would be able to access the full amount of their deposit. Copyright 2016 UBS AG, Australia Branch. All rights reserved. No part of this web page may be reproduced or distributed in any manner without the prior written permission of UBS. UBS accepts no liability whatsoever for the actions of third parties in this respect. © UBS 2019. All rights reserved.